This is going to send the dullest of the dull into one of his famous, hysterical carpet-biting fits. NOTE: If you lack the courage to accept the above facts and you want to continue to deny the truth about the “holocaust,” the “final solution” and the “pure extermination centers,” then the ball is in your court. The supporters of THE FINAL SOLUTION FORENSIC CHALLENGE TM have put their money where their mouths are and it’s time for the criminally fraudulent holocaust industry, their mealy-mouthed “skeptical” minions, their bought whores in the media and their servile Judas-Goats in our government indoctrination centers to put up or shut up. And to further illustrate just what utter frauds Michael Shermer, Andrzej Kola and the members of THE SOBIBOR ARCHAEOLOGY PROJECT are, NAFCASH TM will consider, for the purpose of laying claim to THE FINAL SOLUTION FORENSIC CHALLENGE TM, that Sobibors fraudulent “ASH MOUNTAIN” is one of the alleged “huge mass graves.” This means of course, that this “huge mass graves” exact location and exact dimensions are already known! So you only need to prove that it contains the remains of 2,500 people. What could be easier to do - IF - the claims about this “huge mound of human remains” are true? Now there is no need to wait on Kolas alleged report! What are you waiting for dull one? First he has to find a suitable site, preferably with Fir & Birch trees (visual similarities), then there's the Government approvals (that'll take months if not years) the Permits for lighting fires etc. Then he has to gather a virtual mountain of Wood, fire the whole thing, wait for it to burn down, cool down sift the charcoal, re-fire the charcoal till there's nothing but ash & then build the whole thing up into an "Ash Mountain", add a layer of wind borne deposited top soil, add grass & Age it all to look like it occurred 60+ years ago, & finally go get a whole bunch of his mindless sycophants (with suitably sounding fake Academic Credentials) to all agree in Unison that it IS the Alleged site & get the Holocaust believing Compliant Media to flash it all round the world. What are they waiting for? Proof which will never come. They have no integrity whatsoever. Not a single mass grave can be shown to the public which supports the 'holocaust' story line, not one. "BTW Roberta, why do you keep running from the queations about the soil core samples of Sobibor? 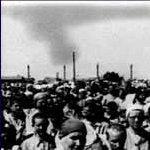 What do the frauds at the Sobibor Archaeology Project say those core samples are comprised of?" "I don’t know what the members of the Sobibor Archaeology Project say about the composition of these samples. In my last phone conversation with Yoram Haimi, I forgot to ask this question. I shall ask it next time we speak." Much work can be done on a voluntary basis, however costs like accommodations, equipment and travel expenses will always need to be covered. Therefore we are looking for organizations and individuals who would like to support us. Our goal is to create a historical site and to show people the real story behind Sobibor. Prior to the end of World War II the camp was destroyed by the Nazis and its story remains elusive until this very day. The primary goal of the project is: to give people insight as to what really happened in Sobibor and to provide proof that the Holocaust actually took place only sixty years ago in the face a growing group of Holocaust deniers. "I’m waiting for the time and means to go to Sobibor, obtain permission to disturb the ash heap (which I doubt will be granted) and enlist the services of an expert to analyze the human remains and certify that they are in fact human remains (which I also doubt anyone will do for just little me)." "Notice how he's trying to imply that there have been core samples taken from the mound. Let's see the photos of these alleged core samples and let’s see the results of the analysis of the alleged samples." Of course the lying coward refuses to produce the evidence. "The human ashes that the mound at Sobibor is comprised of may have been dug out of one of more of the pits discovered by Prof. Kola in 2001." Notice that he's too stupid to understand that the "ash mountain" has been there for years. There is no evidence what-so-ever that there is an iota of human remains in the "ash mountain / huge mound of human remains." No photos of its construction. No photos of the alleged pits that it came from. No photos of any core samples being taken. The "huge mountain of human remains / ashes" is a mystery - just like the holohoax itself. We are told to believe because its contents are self-evident. If the contents of Sobibors mountain is a hoax, then why should anyone believe the stories of the alleged pits / graves? Imagine - a $100,000.00 reward - and basically all one has to do to lay claim to is is to prove that Sobibors "ash mountain / huge mountain of human remains" is actually comprised of human remians! They claim that they're short of money to pay Kola, yet when easy money is dangled right in front of their faces, they act like they have no need for money? Last edited by Greg Gerdes on Fri Aug 29, 2008 12:23 pm, edited 4 times in total. The primary goal of the project is: to give people insight as to what really happened in Sobibor and to provide proof that the Holocaust actually took place only sixty years ago in the face a growing group of Holocaust deniers. We are willing to provide you a detailed proposal and inform you about the status of the project at any time. Ok liars, let's see proof that there is an iota of human remains in the "ash mountain / mountain of human remains." Please include all photos of its construction including photos of the alleged pits that all this alleged human remains were dug out of. And just think - with all the money that TSAP will get for winning THE FINAL SOLUTION FORENSIC CHALLENGE, TSAP can pay kola off and have enough left over to get on with the "excavations" of the alleged "huge mass graves!" This is one of the most priceless prevarications from the dull one yet. I kid you not; I couldn't make this stuff up if I tried. "I don’t remember having claimed that Prof. Kola took core samples from the ash heap." What remains??????? ?NO PROOF WHAT-SO-EVER exists that there is an ounce of human ash in Sobibors alleged "huge pile of human ash," and NO PROOF WHAT-SO-EVER exists that the remains of a single human, much less a greasy jew, are buried in the ground under the slight depressions found near the former Sobibor transit camp. And NO PROOF WHAT-SO-EVER exists that so much as a pound of bone has been found at Chelmno, much less what minuscule amount that has been found is human. "However loudly you yell and however much you capitalize your yelling, it’s nothing but utter nonsense. Given the documentary and eyewitness evidence to what happened at Sobibor, there’s no logical and plausible conclusion regarding the remains contained in the mound at the Sobibor memorial site other than these remains being human remains from the people murdered. All available proof shows that these remains are human remains while there’s no proof suggesting that they are anything other than human remains. That’s the way logic and reason work, Mr. Gerdes. Your above hysterical prayers, on the other hand, are the voice of imbecility and cowardice – the latter in the sense of baselessly and unreasonably rejecting facts contrary to your articles of faith." What if they finally come with falsified evidence that "proves" their claims ? It is very easy to provide false lab analysis from the cores and virtually anything else that helps their cause. Is there any independent individual amongst them, who is incorruptible and only seeks the truth ? Or are they all, determined "Holocaustians" who would accomplish their mission by any means ? What if they finally come with falsified evidence that "proves" their claims ?" Because falsified evidence isn't proof. Only proof is proof. Look at Belzec for example. That is falsified evidence. They had 2 years to use that falsified evidence to lay claim to THE FINAL SOLUTION FORENSIC CHALLENGE and they didn't even dare. I even directly challenged the dull one himself to prove that belzecs alleged huge mass grave #10 contained 1% of the alleged mass murder at Belzec, (6,000), and he couldn't do it and back peddled like crazy and changed the subject. Take a look at the - Gerdes pledges to pay Kola's Sobibor bill - and see for yourself how afraid they are of even trying such a stunt. Remember KostasL, after 65 years, it has yet to be proven that a single alleged "huge mass grave" contains so much as 1% of the alleged mass murder at Babi Yar, Belzec, Chelmno, Sobibor or Treblinka. Not one camp - not one mass grave - not one percent. Unfortunately, only for people like you and me falsified evidence isn't proof. For a huge majority of the people it certainly is. If they come with big name institutions and "scientists" and a well supported mass media campaign (as usual) they win. Only thing that comforts me is that the Holocaust battlefield was, in the past, 99 % theirs. Today Truth has gained some territory, which is a fact of immense importance. Greg Gerdes wrote: The primary goal of the project is: to give people insight as to what really happened in Sobibor and to provide proof that the Holocaust actually took place only sixty years ago in the face a growing group of Holocaust deniers. Well, he's got one thing right; the numbers of revisionists are growing, and I'm living proof. I just started reading the information on this site last year and have been blown away by the depth to which the zionists have gone to perpetuate this myth and demonize the good German people, whom I have I have much respect for. I'd like him to know that I have also turned other people on to this site and they are now either as skeptical as I am to this plot, or outright no longer believe in the myth. Maybe I'll have to email him to let him know. I'm sure of getting my name on the Mossad list for that! 'Well, he's got one thing right; the numbers of revisionists are growing, and I'm living proof. I just started reading the information on this site last year and have been blown away by the depth to which the zionists have gone to perpetuate this myth and demonize the good German people, whom I have I have much respect for." Hello Kevin, and welcome to the holocaust truth movement. "I'd like him to know that I have also turned other people on to this site and they are now either as skeptical as I am to this plot, or outright no longer believe in the myth." That's great. Thank you and keep it up. "Maybe I'll have to email him to let him know. I'm sure of getting my name on the Mossad list for that! " Please do. Yoram has refused to answer anymore of my emails. Please notice how fast they lose interest in communicating with people who refuse to play their sophistic shell games. As for getting your name on "the list," you can't really say you're part of the movement unless you know for certain that the ADL has a file on you. It's a badge of honor that proves to the world that you're a man of courage and character and that you do not fear the jew. The new nafcash update is done. So easy, even Roberto Muehlenkamp should be able to figure it out. We have an exact kind of evidence. We have an exact amount of evidence. We have an exact location where the evidence has to be located / proven to exist. And it could all be located / proven to exist by a blind man with a toy plastic shovel. Just 1/10th of 1% of easily identifiable and quantifiable remains. Now just how hard should that be - IF - the story is true? Greg, the best part about your site is that it is a Debate Stopper, many times on blogs & youtube videos I have demolished the opposition by simply asking them to take up your NAFCASH Challenge, putting an end to denial & earning $100,000 to boot! Needless to say, they never have a comeback.